America’s next generation of skyscrapers could be made from wood. And that's welcome news for the environment. So why is the mayor of Portland, Oregon, calling a modest 12-story tower set for completion there next year “a true technological and entrepreneurial achievement?" It’s not the affordable housing the building affords, nor its dozens of bike racks or even the roof farm that has Ted Wheeler gushing. It's that the Framework apartment building will be made almost entirely of wood. 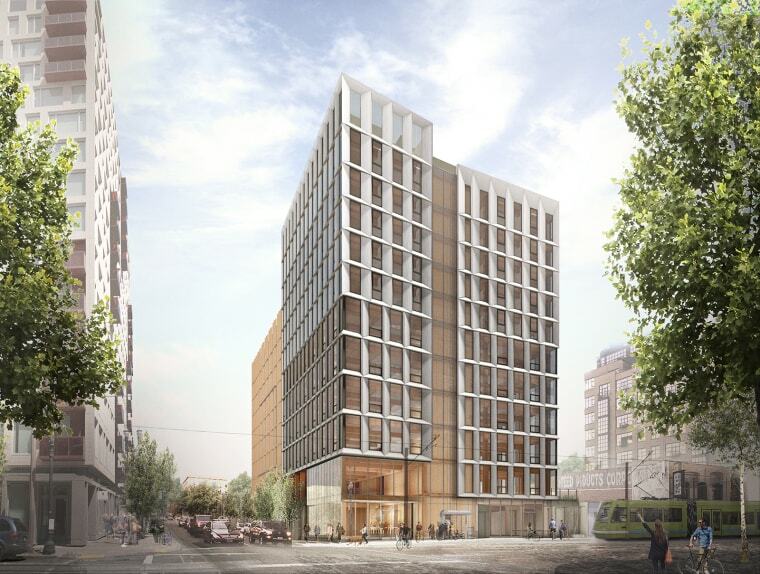 Once completed, Framework will be America’s tallest wooden building and its first “plyscraper” — a high-rise building built with panels made of cross-laminated timber (CLT). These modular sheets are made from cheap, sustainable softwood that are glued or pinned together in layers — a bit like super-strong, super-thick plywood. While the raw material might vary in quality, CLT (also known as mass timber) is engineered to be stronger than concrete. CLT panels resist earthquakes and even fire, charring instead of catching alight like the lumber in typical homes. But mass timber's greatest benefit may be that it's environmentally friendly. “For me, the driving factor is the impact of building with a renewable, sustainable, carbon-storing material,” says Malmquist. The U.S. Department of Agriculture (USDA) agrees. It cites estimates that even a four-story building made of mass timber would save emissions equivalent to taking 500 gasoline cars off the road for a year. This is because while concrete emits nearly its own weight in carbon dioxide during production, trees absorb carbon from the atmosphere to grow. So when a plyscraper goes up, that carbon is locked away for decades. And when the building is finally torn down, the wood can be recycled or burned for energy. “We have a very compelling argument, and a consensus with environmental groups, that sustainably managed forests give a product that is going to have significant impact on climate change,” says Malmquist. In 2014, the USDA announced a $3-million competition to demonstrate the viability of plyscrapers. The winning architects behind Framework got $1 million to help ensure compliance with building codes that are struggling to keep up with the rapid pace of mass timber. Other countries are already forging ahead with plyscrapers. Australia has a 10-story luxury wooden condo, the Norweigian city of Bergen has a 14-story apartment building, and London is considering the erection of a gargantuan 80-story mass timber office block called Oakwood Tower. But Canada is the epicenter of ambitious CLT projects, thanks in part to Vancouver-based architect and mass timber evangelist Michael Green. Green has built several large mass timber buildings, including the seven-story T3 building in Minneapolis and the eight-story Wood Innovation and Design Centre in Prince George, British Columbia. And he's working on a 35-story wooden mixed-use development in Paris, called Baobab. Malmquist might have a point. The other winner of the USDA competition was a 10-story wooden condominium planned for Manhattan. Though it received $1.5 million in 2015, the project was abandoned earlier this year, in part because New York City’s regulations do not permit wooden structures over six stories. SmartLam has provided CLT panels for an Amtrak station in Tacoma, Washington, two mass transit centers on the East Coast, and many agricultural and residential properties. “As builders, developers, architects and engineers dip their toes in the water, we’re seeing that projects naturally growing, both in scope and scale,” says Malmquist. SmartLam has just finished more fire and blast testing of its CLT panels at the Bureau of Alcohol, Tobacco, Firearms and Explosives laboratories in Washington, D.C. Data from those experiments will be incorporated into the next version of the national building codes, due in 2021. The value of official recognition for CLT can’t be overstated. The State of Oregon and the City of Portland have issued Framework a construction permit but only with the help of a hefty USDA award to prove its safety. When CLT finally takes root in national building codes early next decade, eco-friendly wooden high-rises should become easier and cheaper to build. For plyscrapers, the future is looking up.